On the night of Monday, Nov. 26, 1934, George "Baby Face" Nelson, his wife Helen and his partner John Paul Chase were just outside Chicago in a Ford pick-up Chase had obtained some days earlier. During the early evening hours, Chase and Nelson discarded the truck and stole a Ford V-8 sedan (motor number 18-1110789) belonging to Harold W. Prince of 2639 New England Ave., Chicago. The auto was stolen from a side street, and was reported missing the following morning by Prince. Later that night, the trio met Clarence Lieder and Joseph Raymond Negri on the Northwest Highway (the main highway at the time) just outside Chicago in Barrington. Lieder and Negri were freelance robbers, and Negri had worked with Nelson several times. He was also believed to have participated in several holdups with Nelson in the weeks just prior to Nelson's death. (Negri, known as "Fatso," would use his knowledge of Nelson and others for sentencing consideration after he was arrested several months later.) During the meeting that night, Nelson gave Lieder money for the purchase of a large amount of ammunition. They agreed to meet the following night when Lieder would deliver the ammunition. The morning of Tuesday, Nov. 27, dawned cold and overcast. The forecast was for possible light snow by afternoon. The trio, staying in a remote cabin in the Lake Geneva, Wis., area, rose shortly before noon. Helen prepared a light, cold breakfast, and Nelson and Chase made plans to head back to Chicago. They needed to meet with some people and they needed to keep the appointment with Leider and Negri. Nelson, now the most wanted man in America, decided it would be to his advantage to travel by day since it was likely the police would expect him to only be on the road at night. They left within the hour, and late that afternoon it was confirmed the trio were briefly at the home of Hobart Hermansen of Lake Como, Wis. Meanwhile, in Chicago, Special Agents William Ryan and Thomas McDade were investigating the Arthur Bremer kidnapping (eventually attributed to the Barker-Karpis gang). When they checked in with headquarters, Inspector Samuel P. Cowley, who headed the office, instructed Ryan and McDade to proceed immediately to the Lake Geneva, Wis., area. He said they would be met by three agents already there and they would take part in a manhunt for Nelson, whom the FBI had been tipped was in the area. Cowley said he and three other agents were also headed to the area. Armed only with handguns, Ryan and McDade left for Wisconsin on the Northwest Highway. As they left, Ryan wrote down the make and license number, 639-578, of the car Nelson was believed to be driving, and pinned it to the visor. At the same time, Cowley and Special Agent Herman E. Hollis were leaving for Wisconsin in a Hudson sedan. Two other agents were also leaving in a separate vehicle. Both Cowley and Hollis had been at the Biograph Theater in July as part of the ambush team that shot and killed John Dillinger. 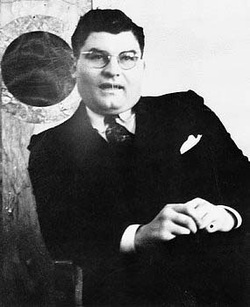 Hollis was confirmed to be one of three agents who actually shot Dillinger. Both agents had also been part of the manhunt for Charles Arthur "Pretty Boy" Floyd the previous month in Ohio, in which Floyd was killed. After 40 miles out of the city, as Ryan and McDade were entering Fox River Grove, they saw a Ford sedan with Illinois plates approaching them from the north. As it passed, they later reported, they both saw the first three numbers on the plate - 639. Ryan noted there were two men and a woman in the car. He told McDade to turn around. In the other car, Nelson noticed the two men noticing him, according to Chase during his trial months later. It had long been believed that Nelson suspected they were federal agents and decided to draw them into a fight. Most likely, however, Nelson believed he had inadvertently come across a trap being set for him and simply tried to run. No matter, Nelson made a U-turn and headed back north. A short distance up the road, McDade and Ryan had also made a U-turn and headed south. Within seconds, the two vehicles passed again. This time, neither car had any doubt. Before McDade and Ryan could react, however, Nelson made yet another U-turn and within seconds was gaining on the agent's car. McDade, just out of training school, suggested they try to stay ahead of Nelson. Ryan, who had been at both the Biograph (where Dillinger was killed) and Little Bohemia (where Nelson, Dillinger, and others escaped after a gun battle), told McDade to hold his speed and let the other car catch up. "We need to take a look at them." He then removed his weapon, a Super .38, and placed it on his lap. As they sped through Fox River Grove, McDade watched in the rear view mirror as Nelson's powerful Ford drew closer. A short distance later, the Ford suddenly shot forward and pulled alongside the agents. Nelson, wearing a cap and sunglasses, leaned across his wife and waved his arm. "Pull over!" he shouted. "Pull over!" As Helen leaned forward and Nelson's car fell back a few feet, Nelson turned and said something to Chase in the back seat, Ryan later reported. A moment later Chase leaned forward and began firing an automatic rifle through the windshield at the agents. McDade, six feet four, wrote in his report that he slid down in his seat trying to keep his head lower than the rear window of his vehicle. Ryan, meanwhile, began firing his automatic through the rear window at Nelson's car, his empty shells ejecting into McDade's face. Nelson was firing with his left hand (he was right-handed) and his shots were going wild. Chase, however, was aiming more carefully. Years later, Chase said he couldn't figure out what was keeping the agents alive. What he didn't realize was that the dumdum bullets in his rifle were mushrooming as they went through the windshield of his own car. As the agents approached the road to Barrington, McDade noticed Nelson's car was no longer in sight. "Where are they?" he shouted to Ryan. "They're fallen back," said Ryan. "Speed up so we can call this in." McDade tried to turn onto the Barrington road, but his turn went wide and the car ran into a field. Both agents jumped from the car and waited at the side of the road for Nelson and what they were certain would be a shootout. Nelson never drove by. What Ryan and McDade didn't know was that another FBI vehicle had joined the chase. Cowley, 35, and Hollis, 26, had encountered the running gun battle as they headed in the opposite direction. They turned their vehicle around and joined the chase. Less than a mile from the Barrington road, as the second federal car began to come into sight of Nelson, the outlaw's car began to sputter and jerk. One of Ryan's bullets had hit the water pump. This was confirmed by a truck driver, Joe Duncan, who told police that when Nelson's car passed him, it was leaking heavily. With his car disabled, the second federal vehicle nearly at his bumper and not knowing where the first federal car was, Nelson had little choice but to pull off the road into the entrance of North Side Park, just over the Barrington line. It was just before 4 p.m. and it was the beginning of the end. In less that 10 minutes two people would be dead, one car would be disabled and a second one covered in blood. And a young, off-duty policeman would secure his place in outlaw history, only to have it removed when history was rewritten in Washington. 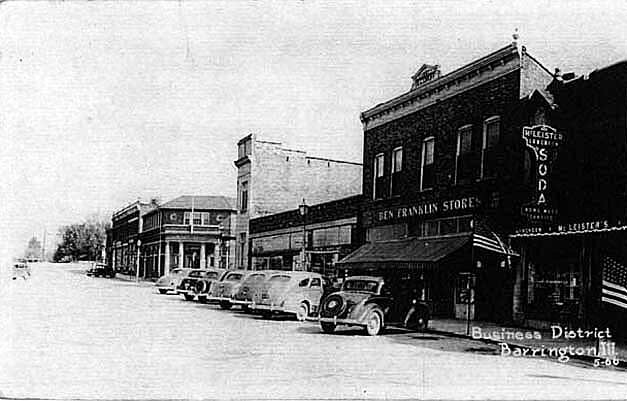 Downtown Barrington at about the time of the shooting.